What a successful week! The June Lunch and Learns at Detroit Historical Museum and Kendall College of Art & Design were a hit. Consumers Energy and DTE Energy joined together with building operators across Michigan to teach them about energy savings incentives, best practices, and how to optimize their building operations. Businesses can take advantage of these savings through DTE and Consumers by completing applications online. Building operators heard from Global Energy Manager at General Motors, Al Hildreth. Al shared General Motor’s 2020 strategic plan for energy and carbon reduction that began in 2010. They used LEED principals as a guide for their practices and by 2014 they were using a total of 11% less energy. Right on track of meeting their goal of 20% reduction. General Motors is a leading influence in energy efficiency. Their dedication to reducing carbon and energy, and optimizing their buildings performance is something to be admired. Some successful tips offered by Al were: top leadership support, obtaining resources (dedicated people & budget), and establishing energy as a pillar of the business plan. General Motors energy a priority is a sure way to a successful practice. 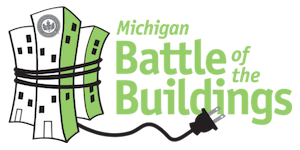 The events were two of the many Michigan Battle of the Building’s educational events held throughout the year where building operators can learn from energy leaders across the state.